Deep joint pain responds very well to low-level lasers because of their role in decreasing inflammation molecules that cause swelling and pain after an injury. Inflammatory chemicals are released from both acute and chronic injuries, which activates pain sensors and increases fluid around the injured cells. These chemicals also increase pain levels and play a role in chronic pain. A great example of this is someone with severe acute and chronic ankle sprains. As you are aware, ankle sprains are very common and have a tendency to not completely resolve. Many people with severe ankle sprains report experiencing multiple sprains in the years following because they are unable to fully decrease the pain, inflammation, and restore previous ankle strength and proprioceptive levels. 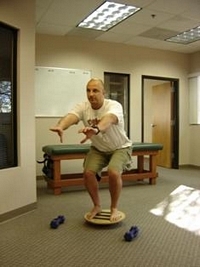 Proprioception refers the body's balance receptors and how it keeps itself oriented in space. If you were to step on someone's foot, the ankle joint receptors would sense that twisting motion; which immediately triggers muscle contraction to stabilize the ankle, preventing an ankle sprain. However with many ankle sprains, these proprioceptive mechanisms are not properly rehabilitated, leading to future injuries when these safety systems cannot protect the ankle. Proper therapy and treatment involves returning the sensors to their optimal level. Proprioceptive exercises and balance activities help prevent future injuries by teaching the body to listen to the joint receptors and improve muscular response in the ankle. However in the weeks following an ankle sprain, inflammation and chemical markers shut off and slow normal proprioceptive function. Low-level laser therapy decreases these inflammatory markers to help restore normal proprioceptive functions and to activate muscular control. Low-level lasers can be an excellent tool and therapy for returning athletes to the field after their sprains, strains, and joint injuries. 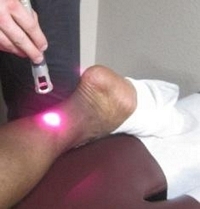 Combining low -evel laser therapy with Graston Technique, ART, massage therapy, and proper exercises can help prevent future injuries and enhance athletic performance.